Last night I went camping. Our site was surrounded with grassy orchard type areas, boulderous mountains, and many, many skeletons of trees that had been burned in a forest fire a few years back. 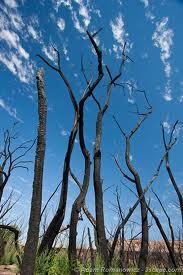 I look upon burned trees not with sadness, but with awe. In my eyes, they are beautiful. There is just something about the way they look. Strangely magnificent. Dignified. They are like monuments to their previous lives. They are a homage to what they once were and to the new life that grows around them. They gave their life to new life. They were not sad to go. They did not fight to stay. They simply melted their life into the flames, giving their energy back to the universe so that something else may thrive in their place. Just like all of life. We live while others die, and we die so that others may live, continuing in this experience of moments through the eyes of one little part of the whole. On the process of letting go–part 2.